Rabbi tells how Waqf guard falsely claimed he prayed on Temple Mount, Arab Israeli police officer kicked him out. 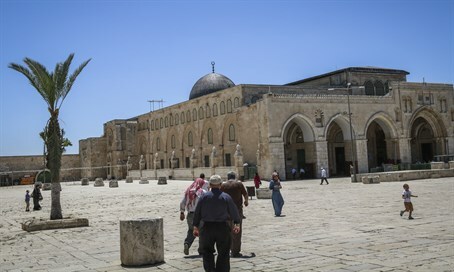 Rabbi Shimon Ben-Tzion of Kiryat Arba in Judea was distanced from the Temple Mount on Thursday, Israeli Independence Day, after a member of the Jordanian Waqf falsely claimed that he prayed at the site. Despite Israel having liberated the Mount - the holiest site in Judaism - in the 1967 Six Day War, the Jordanian Waqf has been left in de facto control of the site, and Israeli police kowtow to the Waqf's discriminatory ban on Jewish prayer at the site. Rabbi Ben-Tzion, who has a custom of visiting the Mount every Independence Day, told Galei Yisrael radio that "at 7:30 a.m. I went in to the Temple Mount with a group of Jews." "Everything was permitted and arranged, and after a few minutes Waqf members encircled us as is their way," he said. "Only one of them thought that I was praying, he saw me concentrating and decided that I was praying. He turned to the police officer at the site and told him, indicated to him: 'here's a Jew daring to pray and on Independence Day on the Temple Mount.'" The police officer ordered to expel the rabbi from the Mount. Rabbi Ben-Tzion tried to explain, but to no avail. "I argued, I said what I said, he didn't want to hear me - not even half a word. These two people, the Arab officer of the Israel police and the wicked Waqf member, ejected me from the Mount saying that I can't return to the Mount until I have a hearing and a clarification and more," reported the rabbi. "It is a shame that this is what happens on Independence Day, but that's part of the land of Israel. I believe that the day is not far when Jews will be able to freely ascend the Mount to pray, and we will merit the building of the Holy Temple."